Wacky Watercooler Blog Hop – Holiday Time! Welcome to our October Wacky Watercooler Blog Hop – featuring ideas for your holiday celebrations! Wow – do you know that as of today – October 23rd – there are only 62 days until Christmas?! Yikes!! I mean, our Canadian Thanksgiving is over, the U.S. Thanksgiving is coming up; so is Hallowe’en – then before we know it – boom! – it’ll be Christmas! Now, if you’re seriously into crafting of any type, you’re probably thinking ‘what’s the big deal?’, because you’ve been working towards this for the last 6 months, at least! But for those not-so-prepared – this is it – time to get cracking! 🙂 Which is why we of the Wacky Watercooler gang are here to provide you with some inspiration and hopefully shave off a few hours of your crafting time (and some of your stress) to help you get ready to celebrate your holidays in style. If this is your first blog tour, it’s very easy to take part. Each of the participating blogs are linked in a circle, so that no matter where you start, as long as you keep clicking the ‘Next’ or ‘Back’ button at the end of the post, you’ll keep moving through each blog, so you won’t miss a creative moment! Or, if you prefer to hop about at your leisure, simply peruse the list of participants, click on the name that you wish to visit, and you’re there. Easy-peasy! If you’re taking the forward route, then you’ve arrived here from the amazing Miss Jean Fitch’s blog – we are so glad to have Miss Jean back with us after a bit of an absence, which was dearly felt by all of us. Jean is one of the ‘originals’ of the group, along with Darrah Hopper who started the Watercooler on our demo-only site; even though a lot of us only know each other as demonstrators via our online connection, we are a very tight-knit group; a better group of people you’d be hard-pressed to find! So now that you’ve been dazzled by Jean’s projects – or if you’re traveling backwards, by the fabulous Christine – let’s see if I can tempt you with my projects! This is my first attempt at the ‘Faux Stained Glass’ technique – how do you think it turned out? I’m pretty pleased with it, but I’d like to do more practicing. Besides, it’s a fun technique to do! 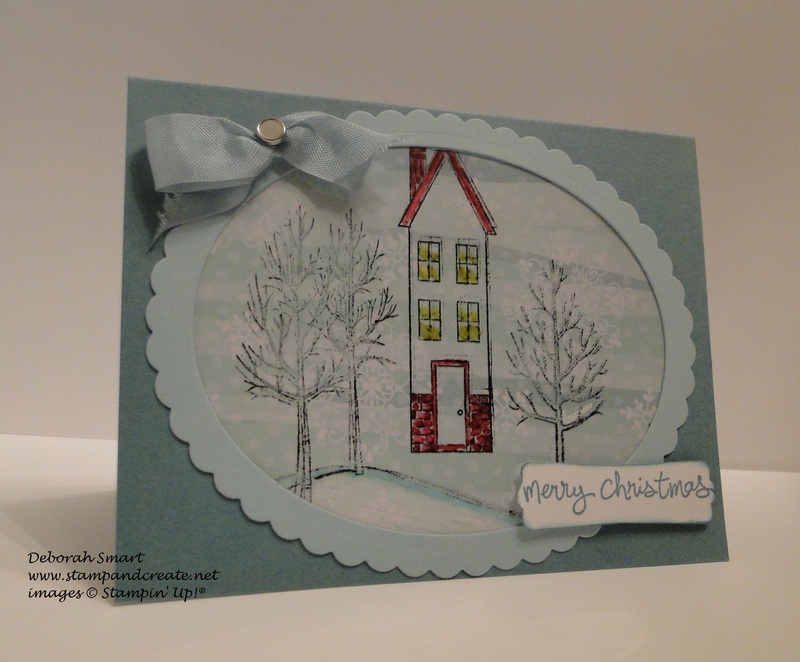 I started by combining the house from the Holiday Home stamp set and the trees from the White Christmas stamp set both onto my largest block (Block F) at the same time. Yes – at the same time! How awesome is that – you can create the scene before you even apply ink 🙂 I then inked up the stamps with Staz-On black, and stamped onto a piece of Window Sheet, which is a clear acetate. When I knew the Staz-On was dry, I flipped it over, and used my Blendabilities Markers to colour in the house, and add some white ‘snow’ to the trees and ground. Here’s something I wasn’t sure would work – but it did! – I used my Chalk Marker to add the snow! In the photo it doesn’t show well on the trees, but you can see it on the ‘ground’ underneath the trees; pretty cool, right? Another use for the Chalk Marker! I love it when I can find more uses for our tools! After colouring, I flipped the Window Sheet over again (so that the colouring is on the back, and adhered it to a piece of All is Calm Designer Series Paper. I just love this particular design – with the streaks of blue, and snowflakes, it looks like a wintery scene all by itself 🙂 I then made a frame using the largest and 2nd largest of the Ovals Dies in Pool Party card stock, and mounted it all on a Lost Lagoon card stock base. 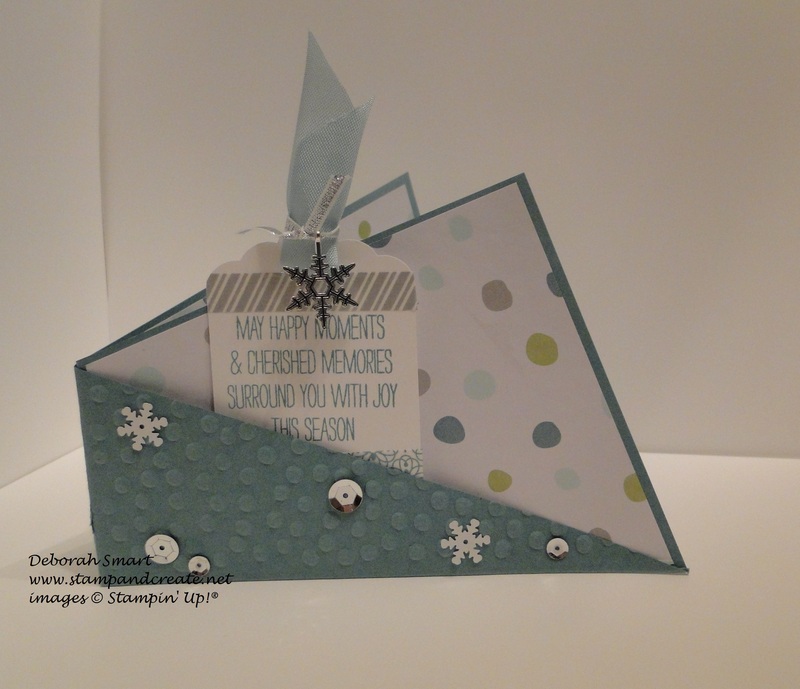 The sentiment was stamped using the Hostess special set Good Greetings in Lost Lagoon onto Whisper White card stock. I used some of the gorgeous 1/2″ Seam Binding ribbon in Pool Party, with a 1/8″ Mini Brad in the centre. I’m not sure what this kind of card is called; I’m going to call it a Fold & Twist card! What you do is cut your card stock base at 4 1/4″ x 11″, score on the diagonal lengthwise; fold on the score line, then fold in half! Then, decorate as you like. I decided to use a base of Lost Lagoon, with a different design from the All is Calm DSP. I then embossed just the outside & inside ‘triangles’ of Lost Lagoon’ with the Decorative Dots embossing folder, and added some Frosted Sequins on top. I then stamped the sentiment from the Wondrous Wreath set in Lost Lagoon onto a 2″ x 4″ Whisper White card stock, and used the Scallop Tag Topper punch on the top. I layered the All is Calm Designer Washi Tape along the top & bottom of the tag, and finished it off with an All is Calm Snowflake Embellishment tied with 1/8″ Silver Ribbon onto 1/2″ Seam Binding Ribbon in Pool Party. The inside of the card has the same ‘pocket’, that you could use to tuck in a gift card, or some cash, or add another sentiment. I hope you’ve enjoyed my projects for today’s Hop; I would love it if you have time to leave me a comment, and let me know you were here! If you’d like to order any of the products I’ve used on these projects, simply click on the product image (below) and you’ll be taken directly to my online store. Now you’re off to see the fabulous Christine Giuda and her amazing projects – all you have to do is click the ‘Next’ button below. Previous Previous post: Creative Craft Escape – Fun, Fun, Fun!! Next Next post: Weekly Deals, Project Life Giveaway, & more Creative Craft Escape Fun! 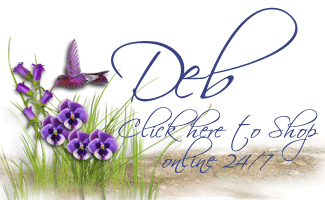 love your projects Deb. I’m gonna have to try the window stain trick. Beautiful work, Deb. As always! 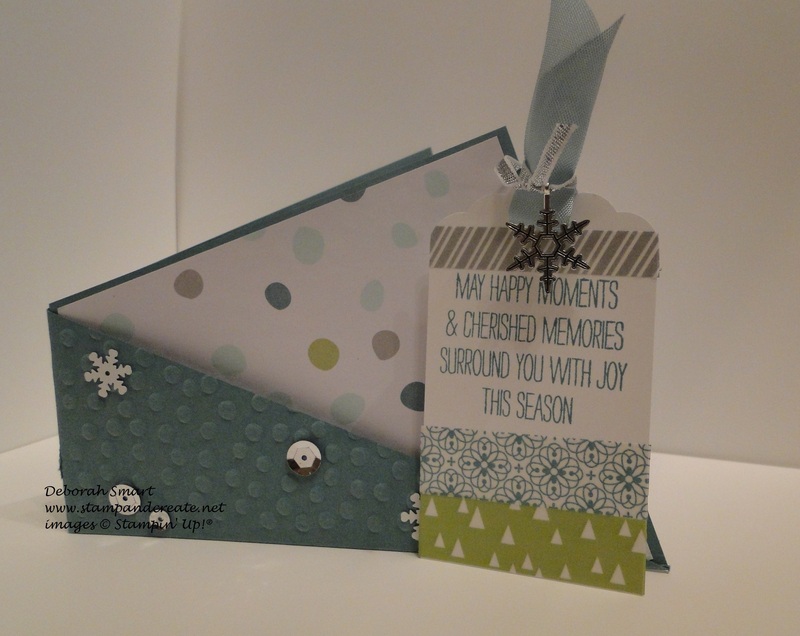 Deb, I’m loving the color combos in both your cards, I am going to attempt the fold on your second card. Love your cards! Thanks for the tip with the chalk marker. Nice cards, Deb. I love a good “blue” Christmas! Tempting indeed Miss Deb. Love the calm and cool color combo of Pool Party and Lost Lagoon in your projects. Funny how they both have water images in the titles…do you suppose SU planned that? And is that why they work for winter and snow themes so well? Very cool stained glass technique and thank you for the detailed description. That’s one technique I tend to forget how its done even though the concept is fairly simple. I still scratch my head and wonder…now you’ve explained it and given us such a wonderful example I’ll have to put my CASE’ing hat on and get to it. I love how well the two sets White Christmas and Holiday Home go together. More SU Magic for sure! Kelly Gettelfinger will forever be enshrined as the creator demos bless for those fun fold twisted greeting cards. She’d love your addition to the style. Who knew it was so simple to create? Thanks again for sharing the details. And the fun of hopping together. Love you girlfriend! It’s so wonderful to have you back, Jean! Thank you for your kind comment – and for letting me know that Kelly Gettelfinger was the originator of that fun fold twisted card! 🙂 I wonder if Stampin’ Up! combined the Pool Party & Lost Lagoon in the DSP, and that’s how they decided to call it “All is Calm”?! Deborah, Love the beauty of the stained glass technique card. It is such a homey card to celebrate the season! sweet cards, Deb, love the color combinations!